"Hi! I'm Grant! I'm a recovering racist." This came to me in the night with a lot of other dreams of really weird stuff, but this might just work! 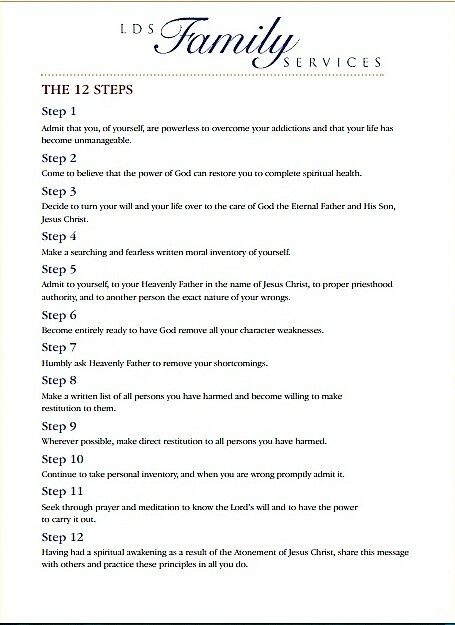 The LDS Church has done really well in applying the 12-Step program for drug abuse and some sexual issues borrowed with acknowledgment of and slight modification from Alcoholics Anonymous or AA. So how does is apply in our Racism Recovery program? Step 1: Admit that you, of yourself, are powerless to overcome your racism and that your racism has become unmanageable. Recognizing a problem is the first step to recovery. That's long been the premise of AA. Sometimes it takes a complete crash to the gutter, a harsh intervention, or maybe death of innocent, non-violent anti-racists and a harsh rebuke from your church that "white-supremacy," "white-nationalism," and promotion of "white culture." are sinful and contrary to the Gospel of Jesus Christ. Part of this is interventionist. You are a racist. We all are to some degree or another. I suffer from existential guilt from my basic personality, so I come by some of this naturally. And I have always placed hope in the Atonement to heal me from the sins of my generation of which institutional racism is a part. This is imposed upon us by a dominant, white, Anglo-Saxon, Protestant culture and we have become beneficiaries and willing participants. If I'm not getting through to you, please read the church's statement again, linked above and here, and this essay from Gospel Topics in LDS.org (official website of the Church of Jesus Christ of Latter-Day Saints). Read this very carefully and think, even ponder, what it means. I hope we're getting through to you. If not, maybe you're not quite ready for recovery. 2. Come to believe that the power of God can restore you to complete spiritual health. This is one the church slightly modified from AA which promotes an more ambiguous "power greater than ourselves." But I like their ending, "can restore us to sanity," because this is a bit of mental or spiritual illness. However you conceive of a higher power, or inner-self, or unity with the universe, I sincerely believe He, She, or It can help us. 3. Decide to turn your will and your life over to the care of God the Eternal Father and His Son, Jesus Christ. This is the same modification from the "higher power," but it works for me. If you are not LDS, there are other ways you can word and interpret this. If one other thought might help back with step one of intervention at least with any LDS readers, think of the Nephite disease of "pride" from the Book of Mormon. Substitute "racism" for "pride." Yeah, that works! 4. Make a searching and fearless written moral inventory of yourself. Well, check that off my list! See here. 5. Admit to yourself, to your Heavenly Father in the name of Jesus Christ, to proper priesthood authority, and to another person the exact nature of your wrongs. Well, my past and I think present bishop know where I am on this. I've also discussed with my SP. And the fact that I have placed my writings out there on the blog is a form of sharing. It would take me some significant work and I should probably do it to identify all the harm my own racism has caused others. This is painful. And prayer will continue. 6. Become entirely ready to have God remove all your character weaknesses. Whoa, this is getting pretty heavy. It is powerful. 7. Humbly ask Heavenly Father to remove your shortcomings. 8. Make a written list of all persons you have harmed and become willing to make restitution to them. Oh, no! This is a practical impossibility. Yet, if it is an institutional or multi-generational problem, are reparations possibly appropriate? 9. Wherever possible, make direct restitution to all persons you have harmed. Once again, a tragically impossible practicality. But some things can be done. 10. Continue to take personal inventory, and when you are wrong promptly admit it. 11. Seek through prayer and meditation to know the Lord’s will and to have the power to carry it out. 12. Having had a spiritual awakening as a result of the Atonement of Jesus Christ, share this message with others and practice these principles in all you do. One eighth of the whole population were colored slaves, not distributed generally over the Union, but localized in the Southern part of it. These slaves constituted a peculiar and powerful interest. All knew that this interest was, somehow, the cause of the war. To strengthen, perpetuate, and extend this interest was the object for which the insurgents would rend the Union, even by war; while the government claimed no right to do more than to restrict the territorial enlargement of it. Neither party expected for the war, the magnitude, or the duration, which it has already attained. Neither anticipated that the cause of the conflict might cease with, or even before, the conflict itself should cease. Each looked for an easier triumph, and a result less fundamental and astounding. Both read the same Bible, and pray to the same God; and each invokes His aid against the other. It may seem strange that any men should dare to ask a just God's assistance in wringing their bread from the sweat of other men's faces; but let us judge not that we be not judged. The prayers of both could not be answered; that of neither has been answered fully. The Almighty has his own purposes. "Woe unto the world because of offences! for it must needs be that offences come; but woe to that man by whom the offence cometh!" If we shall suppose that American Slavery is one of those offences which, in the providence of God, must needs come, but which, having continued through His appointed time, He now wills to remove, and that He gives to both North and South, this terrible war, as the woe due to those by whom the offence came, shall we discern therein any departure from those divine attributes which the believers in a Living God always ascribe to Him? Fondly do we hope--fervently do we pray--that this mighty scourge of war may speedily pass away. Yet, if God wills that it continue, until all the wealth piled by the bond-man's two hundred and fifty years of unrequited toil shall be sunk, and until every drop of blood drawn with the lash, shall be paid by another drawn with the sword, as was said three thousand years ago, so still it must be said "the judgments of the Lord, are true and righteous altogether"
With malice toward none; with charity for all; with firmness in the right, as God gives us to see the right, let us strive on to finish the work we are in; to bind up the nation's wounds; to care for him who shall have borne the battle, and for his widow, and his orphan--to do all which may achieve and cherish a just and lasting peace, among ourselves, and with all nations. Abraham Lincoln, Second Inaugural Address, 4 March 1865. How Thick Is Family Blood?